Throughout my academic career, I’ve had ideas thrust upon me with no room for compromise. I’ll admit, most were warranted: Newton’s laws have never triggered my skepticism, nor have Pythagoras’ mathematical assertions (though, granted, I wouldn’t touch geometry with a 20-foot pole). And I’m pretty confident in the whole evolution thing. But of all the knowledge I’ve absorbed without protest, I think I’ve isolated the precise moment when I stopped automatically accepting information presented to me as indisputable fact: When I saw, on an art history class trip, a museum display a bucket and paper towels strewn across the floor and call it art. What? It had to be a joke. My original thought was that a janitor must be in the middle of cleaning up a mess. But there it was: a bright orange bucket and its paper counterparts, in all their underwhelming glory. The absurdity of the scene made me wonder: What was so captivating about this display? What made this art? And in the broadest sense of all: What is art? As spring 2015 dawns on us, full of new resolutions and schedules, students should act during the add/drop period and expose themselves to this debate – one that continues to rage on in the art world – by taking an art history class. I’ve rehearsed a rigid definition for whenever the question “What is art?” is posed to me: Art is a vehicle for human expression that’s beholden to an audience in some fashion. But this technical characterization, taken straight from my high school art history textbook, doesn’t acknowledge the nuances that have arisen out of an age-old debate. It wasn’t until I became an art history minor at GW that I was adequately equipped with the knowledge and pretentious-sounding vocabulary to fully immerse myself in the rhetoric behind art theory. GW’s art history department is limited in courses, offering a meager 24 classes, compared to the international affairs department, which boasts nearly 200. But art history has recruited faculty whose insight into the world of art shines new, innovative light on the subject matter. In my studies, I was prompted to reevaluate my cookie-cutter, hypercorrect definition of what art is and explore its personal significance to me. Suddenly, its meaning evolved beyond a collection of words and static ideas. Before, I had treated the notion of art like some kind of machine, as if one could lay out the components on a conveyor belt and, after slathering on a coat of paint, call the resulting product art. But learning about the revolutionaries who led new artistic movements shattered this illusion of “the standard” for art. The preeminent painter Jacques-Louis David wasn’t subscribing to some kind of formula when he pioneered the neoclassical style. Nor was Die Brüke, a collection of German artists, doing so when it ushered in expressionism, a modernist movement that contradicted every critic’s definition of art with its avant-garde approach. I have come to believe that art has no tangible definition because it is fluid in nature. That’s what’s so exceptional about taking an art history class: The laws of artistic expression aren’t written in stone. They’re malleable and subjective, taking on the shape of the art movements and artists that inspire them. In very few other fields will you find so much room for debate and flexibility. It allows you the opportunity to draw your own conclusions in novel ways. Art history remains a frequently neglected area despite the richness of the subject and our location in the artistic and cultural epicenter that is D.C. Often, this small department is overlooked in favor of more prominent – or what some might call more useful – subjects. There were just 29 art history majors at GW in 2013, compared to the almost 800 students who chose to study pre-business administration or the 300 economics majors. Take a chance this semester. 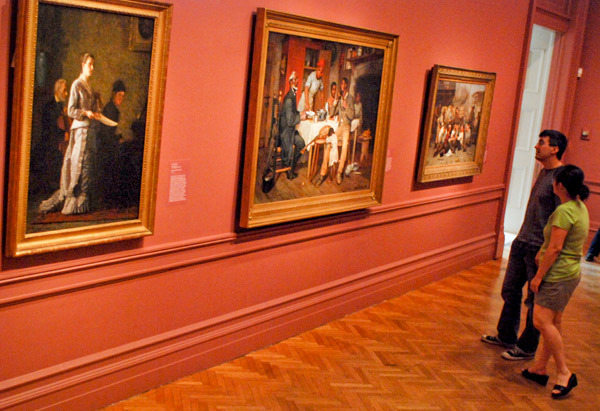 Take an art history class, and attempt to answer the daunting question “What is art?” for yourself. And let me know if your definition includes buckets and paper towel installations because, presently, mine does not. Sasha Kobliha, a sophomore majoring in anthropology, is a Hatchet opinions writer.